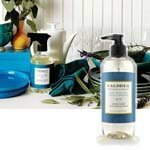 Basil Blue Sage Products by Caldrea | P.C. Fallon Co. Basil Blue Sage gives the freshness of the first sprig of spring. A refined, yet relaxed bouquet of delightful scents from the herb garden. Basil Blue Sage contains the natural essential oils basil, sage, thyme, spearmint, and rosemary with the fragrances of lemon, lavender, jasmine, muguet, cinnamon leaf, musk, cedarwood, and patchouli. Makes laundry, cleaning, and washing dishes a pleasure!